What a gorgeous day it was, leaving my house in the Caledon Hills at 7 a.m. with the birds singing and spring in the air. I was on my way to Toronto’s “airport strip” to pick up two of our guest speakers for the event. When I arrived, I got out of my vehicle and was met by Rob Mortko and Don Dean. To my huge surprise and delight, out walked Kathy and Mike Shadrack, too. Well, all hugs and hellos said, I discovered they had received a phone call from Rob Mortko on Thursday saying, “Come on up,” and they took him up on it. Awesome! We drove to a new venue at Glencairn Golf Club (secured for us by our own Lynne Limpert) and were very pleased to find everything pretty much all set up and ready to go. 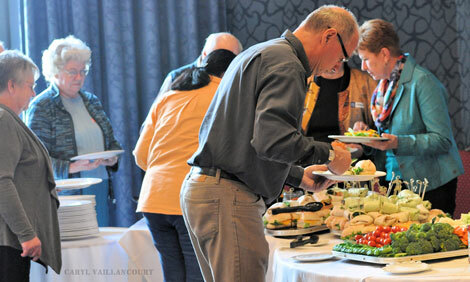 We had a wonderful turnout of sixty-seven people, and everyone had a great day in amazingly beautiful surroundings. It started off with Don Dean’s talk. Don is one of the Editors of The Online Hosta Journal for the American Hosta Society. One of the most valuable ideas I think he imparted to us was to volunteer, suggesting “The friendships you make, the benefits you get, are huge when you get involved.” So true! I know that without volunteers, our own Society would never be able to run and huge events like this one would never be able to go so smoothly. (Thank you to all of our O.H.S. Volunteers). Now, back to Don. Apparently, his mother had him weeding gardens in his youth, so Don vowed, “I’ll never garden when I have my own home!” Well, we see how that worked out for ya, Don. Don took a chunk of one of his mother’s hosta and put it into a corner of his vegetable garden. After “slicing & dicing” it with his rototiller, and having it come back, he thought, “This is a good plant!" That started it all. 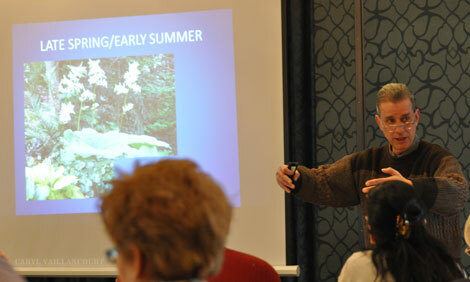 Don showed slides of his garden unfolding in the spring, and the different stages. What an eye opener! You really DO have to get out there everyday or you’re going to miss some good sights! He has been selecting the plants, controlling the crosses (his hosta “protection system”), and culling very successfully, with his first blue Hosta ‘Silver Bay’ coming out in 2003, and a list too long to mention here, ever since. Look for his ’Raucous Ruffles’, ‘Endearing Endeavour’, and ‘Parisian Silk’ coming out in 2013. Here are a few that may be coming out in 2014: ‘Pure Intentions’, ‘Evening Blush’, ‘Peek-a-boo Purple’, ‘Sapphire Pillows’, ‘Leather and Lace’, ‘Celtic Bouquet’, and ‘Thrills & Frills’. WHEW! Can’t wait! Our next speaker was Darren Heimbecker, the creator of Whistling Gardens in Wilsonville, Ontario. I had been out to Whistling Gardens in 2011, prior to its official opening in May 2012, and I have to tell you I was impressed back then and can’t wait to go back this summer to see what has evolved since on the 56 acres. There are nearly 18 acres that have been cultivated and sculpted into 6 major gardens and collections. All the gardens have been seamlessly connected with nearly 4 km/2.5 miles of walking paths. It is home to the largest public collection of conifers in the world, with over 2,350 species, hybrids, and cultivars on site. Darren zeroed in on trees that would compliment our hosta gardens and would be easy to plant beneath. There are over 300 different smaller species of ornamental trees, with interesting bark and foliage colours to have a continuous outdoor focal point in any season. There were spectacular looking slides and a brand new “wish list” for me. We learned that some, such as Golden Hedge Maple are “tough as nails.” Others, like Redbuds, have beautiful leaf colour, and you can plant lots of hosta under them. Chinese dogwood also caught my eye. They are 15 to 18 feet tall at maturity and Darren has 43 different cultivars of them, with many different colours. European beeches are particularly slow growers, which appealed to me for a couple of applications in the garden. Darren also touched on a variety of shrubs to consider, like Gold Scotch Pine, which are golden yellow six months of the year – good to zone 4B. Listening to Darren speak, you just knew that Whistling Gardens is a true labour of love for him. It showed in his presentation and certainly in his gardens. I can think of no one who knows more about trees or carries more interesting and unusual varieties than he does. 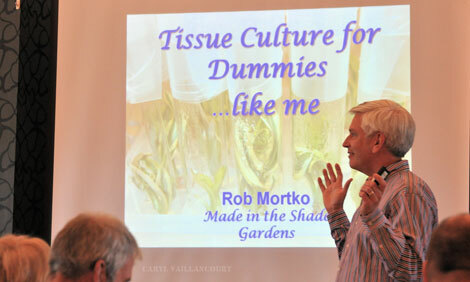 After a lunch of amazing varieties of sandwiches, wraps, salads, and veggie platters, along with Kevin & Olga Elchuk’s fantastic trays of home baked goods, we heard from Rob Mortko on “Tissue Culture for Dummies – Like Me.” (Yes, like me - but that is also in the title). Rob also serves the American Hosta Society as Vice President Genus Hosta. I had no idea that orchids were the first TCs done in the 60s. (I’m sure a lot of us didn’t). Rob went over the multiplier “factor of 4”, which really blew our minds. i.e. : Initiation 1 to 2 and then 8, then x 4 = 32 plants. 32 x 4 = 128 plants. If you root out 120 plants to grow on and get to market you still have 8 plants, which will then equal 32, and so on!!!!! AWESOME! In 12 months it’s feasible to have 100,000 to a half million plants! WOW! My head was spinning! Looking at slides of Rob’s “work space”, you could certainly see a “working lab” in reality. Weigh scales, an autoclave, stirring plate, tubes – it had it all! Very impressive, sterile, and a little bit of a daunting environment, I think, for the neophyte I am. (Forget the auto clave – I’d have to start with the pressure cooker – a little less scary for me). Hans Hansen was Rob’s mentor, and I certainly think justice has been done. In 2000, Rob registered and introduced his first hosta cultivar Hosta ‘Heart and Soul’. There is an amazing line-up in Rob’s creations, including ‘Stitch in Time’. Rob’s talk had us all looking at the possibilities of creating and hoping for an early retirement to get it all happening. TC work was clear as a bell now! Next, in our very full day, was our panel of experts, which included Wild Thang (Rob Mortko), Johnny "Bee" Goode (Don Dean), and South Western Ontario Hosta Society President, Lynn Bischopp. The panel question and answer period was very lively and a lot of fun, as were our silent and live auctions. 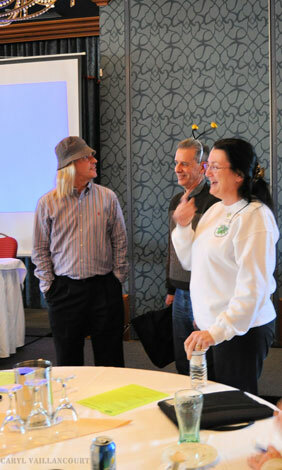 Mike Shadrack did the honours for the live auction and was a master at it, as usual. We are really looking forward to seeing Mike and Kathy when we visit them this summer on our annual OHS Bus Tour, along with two other special gardens in Western New York. 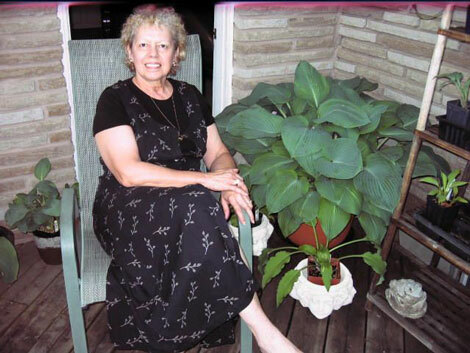 New Author Bio - Sandra’s interest in hosta started in 1994, when she and husband Barry moved onto a three acre parcel of land in the Caledon Hills in Ontario. This property had no landscaping at all and few trees. She bought five bags of hosta, with three rhizomes each in them, to plant in the front walkway. She had to remove every second one in just three years and was hooked. She went to her first Ontario Hosta Society meeting in 1996 and joined the OHS in 1997. Sandra then served the OHS as V.P. from 2003 through 2005, President from 2006 through 2009, V.P. again from 2010 through 2011 (doing double duty as bus tour coordinator in 2010 for the 2011 tour), a position she still holds. The 2011 tour was the first overnight trip for the Society and was a huge success, viewing gardens in the nation’s capital of Ottawa. This year they will be doing their first “over the border” tour, into Western New York in June. Sandra’s collection has 171 different hosta, but she is not sure just how many she has in her gardens because she has been dividing since she learned how in 1997 (at the first OHS meeting she attended). Sandra is also a member of the American Hosta Society, the Greater Toronto Bulb Society, and the Western New York Hosta Society.